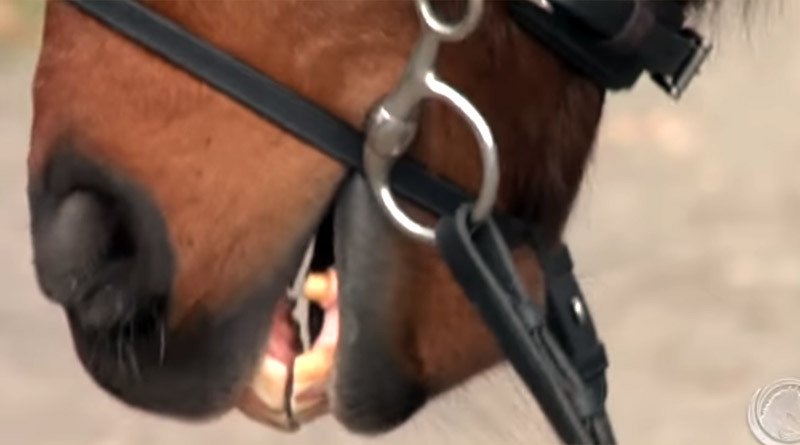 Video: Is your horse struggling with an ill-fitting bridle? A new, free video on avoiding pain for horses when fitting bridles has been released by non-profit equine education organization Equitopia. Micklem and Aleman explain the various areas that can cause potential pain and discomfort due to ill-fitting and overly tight head wear. “We continue to be awed by the level of awareness and thought that should go into every aspect of horse care and welfare,” said Equitopia founder Caroline Hegarty. Examples of poor bit and bridle fit are shown in the video. The lower and upper jaw bones of a horse. Equitopia is working towards a world where humans live in harmony with horses based on understanding and a regard for the horse’s needs. Its mission is to empower the horse industry with reliable resources supported by research and evidence, to guide them in the evolution towards compassionate horsemanship. The above illustrations show the complexity of the horse’s cranial nerves and location of the maxillary, infraorbital, mandibular and mental foramens of the equine cranium. The complexity and origin of the nerves and foramen illustrate the importance of choosing a style of bridle and properly fitting the bridle so as not to interfere or add excessive force on these nerves – invariably causing pain and/or discomfort. © Anatomy of the Horse: An Illustrated Text by authors Klaus-Dieter Budras, W.O. Sack and Sabine Rock. “I wish I had this level of awareness and education when I first started out on my journey with horses instead of learning the hard way,” Hegarty said. “My hope is that as we investigate and share this information that we can influence and guide the equestrian industry to evaluate and examine the training components currently present in all disciplines for validation or improvement with the utmost emphasis on the welfare of the horse.